Our recent trip was filled with good luck and terrific tourist opportunitiesâ€¦ In Amsterdam on Queenâ€™s Day weekend, nearly everything was shut down for the festivities. However, on Sunday of the long weekend, while everyone else was nursing serious hangovers, we got up early and walked to the local tour bus depot. 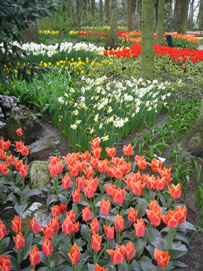 We decided to head to Keukenhof gardens which frankly, I had never heard of before. We just wanted to get out town, see some flowers and perhaps a couple of windmills. 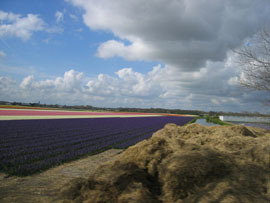 We drove past Schipol airport then on towards the town of Lisse, near the university town of Leiden. Finally, we reached the gates of the Keukenhof gardens which were the gardens of a small castle in the 1500â€™s that had since burned down. 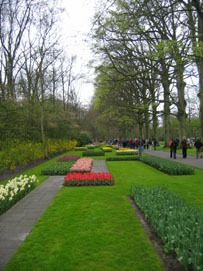 After the war, the gardens were re-opened with the purpose of acting as a showcase for bulb growers across the Netherlands. Today, the gardens are open for just two months of the year from April-June and we were fortunate to visit in late April, at the peak of the blooms. 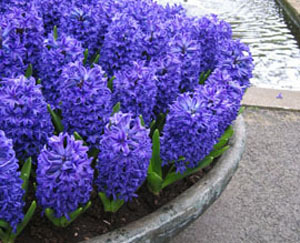 And with nine million bulbs planted each year, this is the motherload of Dutch showcase gardens! 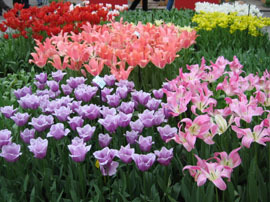 We could have gone to the flower auctions at Aalsmer or if timed right the Floriade which only happens every ten years, but for sheer blind luck, Keukenhof was simply fantastic! It was bit cold (42-45 degrees F) as we arrived but the stunning display of flowers was simply overwhelming. I have never seen so many concentrated blooms in one area. At around 20-25 hectares, the gardens incorporate ponds, spectacular conservatories or greenhouses, buildings, a real windmill, mazes, rose gardens and even a petting zoo. 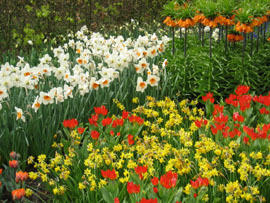 All around the gardens are thousands and thousands of acres of bulb farms with millions or billions of blooms. I wondered why so many blooms were just left on the plants to rot (instead of being sold) but apparently it is just part of increasing the size of the bulbs that are eventually sold for export. In other words, the flowers are a by-product and considered waste materialâ€¦egads! There were also spectacular centuries old elm tries, walking paths, bridges, etc. There were pavilions which showcased the best hybrids that growers had recently developed and which were judged by experts and awarded prizes. There were free floral arrangement demonstrations and exhibits by the different bulb manufacturers. Gift shops, snack stands, restaurants, etc. Even a live floral mural of Rembrandt to commemorate Rembrandt year in Holland. At any rate, I am not a flower expert so my trying to describe this place intelligently is useless. Instead, I have picked out about a dozen plus photographs to give you an idea of what it was like. At about Euro15 per person, it sounds expensive but it was well worth it. And our family photos in the gardens are absolutely priceless. Over 900,000 visitors come to see the gardens in the roughly 2 months that it is open so on a busy Sunday, they can expect 25,000+ folks in one day. As we were leaving the gardens just after noon, there was a line of cars about 3 miles long waiting to come into the parking lots! My daughter was even able to climb up an old-fashioned windmill and take in the surrounding countryside. My camera is as amateurish as it gets and I am a lousy photographer so I fret that I have done the gardens a disserviceâ€¦ Anyway, if you are ever in Amsterdam from April to May, try and spend a half day at the Keukenhof gardensâ€¦it was absolutely beautiful. More photos in the next post as well. I LOVE THESE PHOTOS!!! 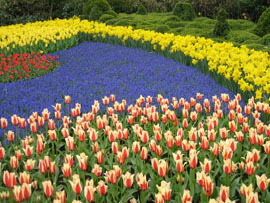 THANK YOU..
Its just about the same with the Butchart Gardens…where you can see a lot of beautiful flowers…nice pixs!!! It was the most beautiful place on earth I’ve seen when I went there in the 90s. Would pay an arm and a leg to go back there again:) Glorious photos! Oh… what a wonderful photo… I really love flowers…nature.. since it depects on the presence of our Divine Creator. Thank you MM for your kindness in giving me life today with your marvelous pictures. I know someday I can visit those places too. lovely pics, Mr MM. sana makapunta rin ako sa mga lugar na yan. i love flowers, they’re the most beautiful things. and to be surrounded by so many of them..wow. i agree with what you said about the pricelessness of your family photos in the gardens.